“We used to work around 13 hours a day every day of the week with only two days per month off,” Saw Myo said. The pair now owns and manages Mount Gambier’s Noodle Sushi Bar across two locations. They met for the first time in Mount Gambier after they followed similar paths from their home country of Burma, seeking freedom in Malaysia before finally finding stability in their third and final home in Mount Gambier. Escaping the constant persecution of Burmese soldiers in the Karen state in Burma, both were in their mid-twenties when they fled through Thailand to Malaysia. “We did not want to live in refugee camps, so we went to Malaysia knowing we could find work there and earn some money,” Saw Myo said. “I found a job in a restaurant where I learnt step-by-step how to cook. “There was no limit to the amount of hours they let us work per day and in return we got paid very little money, were given shared accommodation to stay and meals. Taste of Success: Karen refugee Saw Khain owns and manages the city’s two bustling Noodle Sushi Bar outlets with business partner Saw Myo. Although registered as refugees while living in Malaysia, they were not entitled to any support from the government. Both Saw Myo and Saw Khain were told by the UNHCR they could apply for humanitarian visas to another country, but had no say in where they wanted to settle. “After I applied for my visa, the UNHCR gave me one week of training,” Saw Myo said. Saw Myo arrived in Australia in 2012, while Saw Khain arrived with his wife and their son in 2013. 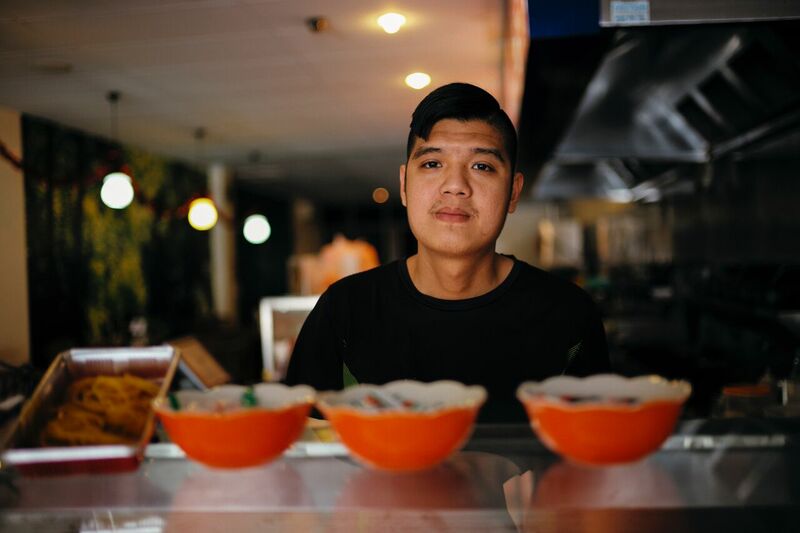 Taste of Success: Karen refugee Saw Myo completed a Certificate II and III in Hospitality upon his arrival in Mount Gambier and now is now operating two businesses. Saw Myo completed a Certificate II and III in Hospitality at Mount Gambier TAFE and worked at various restaurants in the city, first part-time and later fulltime. When the pair met, they were driven to enjoy the independence of owning a business. 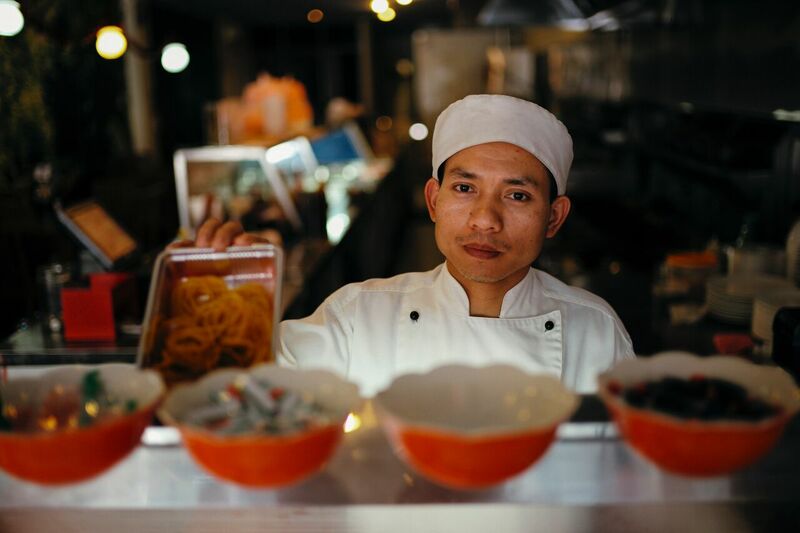 Last June, Saw Myo and Saw Khain secured ownership of the Noodle Sushi Bar in the city’s bustling main street. The pair opened a second outlet at the Mount Gambier Marketplace last month. “It was hard to learn English at first, “Saw Khain said. “When I lived in Burma I spoke Karen and Burmese, then I went to Malaysia and had to learn Malaysian and because I worked in a Chinese restaurant, I had to learn Chinese. “So, English is the fifth language that I am learning and I find the pronunciation and grammar to be very difficult.” For Saw Myo, who speaks Karen, Burmese and Malaysian, English was the fourth language he had to master. “We are very happy in Mount Gambier,” Saw Khain said. “Our Karen community has always been very supportive and helped us to settle in. “When I arrived I had only $200 and my wife and I were very surprised when the government gave us furniture, a fridge and television in our rental property. Now the pair are ready to pursue the next milestone. “We are now saving hard so we can buy our own homes,” they said.